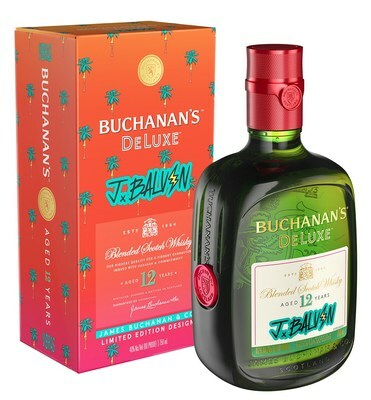 NEW YORK, Feb. 20, 2019 /PRNewswire-HISPANIC PR WIRE/ — BUCHANAN’S Blended Scotch Whisky is proud to announce the release of BUCHANAN’S DeLuxe Blended Scotch Whisky x J Balvin Limited Edition Design. The custom design of the award-winning 12-year-old blend was created by global Latin music artist J Balvin, who has partnered with the brand for its Es Nuestro Momento campaign since 2016. The exclusive release marks the brand’s first-ever product collaboration and represents its commitment to celebrating the greatness of the Latin community. During the multi-year partnership, the brand and J Balvin have worked to bring the Es Nuestro Momento spirit to life. Together, they have celebrated rising music talent, giving producers and creators a chance to feature J Balvin on a track. BUCHANAN’s Blended Scotch Whisky has also sponsored Balvin’s last two U.S. tours, encouraging fans of legal drinking age to “leave their mark” at the brand’s Casa Buchanan’s tour experience. Most recently, they have spotlighted artistic talent with a national pack design contest. 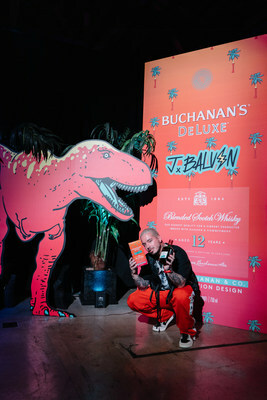 BUCHANAN’S DeLuxe Blended Scotch Whisky can be enjoyed responsibly in J Balvin’s signature ‘La Familia’ cocktail, with guava juice, lemon juice, simple syrup and topped off with soda. The BUCHANAN’S DeLuxe Blended Scotch Whisky x J Balvin Limited Edition Design will be available until supplies last in CA, TX, FL, NJ, NY, IL, AZ and CO wherever fine spirits are sold with a suggested retail price of $31 (750 ml/bottle, 40% ABV). For additional information on BUCHANAN’S Blended Scotch Whisky, please visit www.BuchanansWhisky.com. Stay up to date with the brand by following @BuchanansUS on Facebook, @BuchanansWhisky on Instagram and @BuchanansUSA on Twitter. BUCHANAN’S Blended Scotch Whisky is the ultimate choice for those who are working hard to follow their dreams and who enjoy sharing their success with others. BUCHANAN’S Blended Scotch Whisky is a proud champion of Hispanic culture and believes Es Nuestro Momento to celebrate the new generation of leaders and their contributions to American culture. The BUCHANAN’S Blended Scotch Whisky brand has more than 130 years of authentic heritage, and every bottle represents James Buchanan’s commitment to creating the finest blended Scotch Whiskies. The BUCHANAN’S Blended Scotch Whisky Portfolio features five award-winning marques, including: BUCHANAN’S DeLuxe Blended Scotch Whisky, BUCHANAN’S MASTER Blended Scotch Whisky,, BUCHANAN’S Select Blended Scotch Whisky, BUCHANAN’S Special Reserve Blended Scotch Whisky, and BUCHANAN’S RED SEAL Blended Scotch Whisky,. All of these marques have been recognized in the most prestigious international spirits competitions. For more information, visit www.BuchanansWhisky.com or connect with us on Facebook: www.facebook.com/BuchanansUS, Instagram: www.instagram.com/BuchanansWhisky, and Twitter: www.twitter.com/BuchanansUSA. Diageo is a global leader in beverage alcohol with an outstanding collection of brands including Johnnie Walker, Crown Royal, Bulleit and Buchanan’s whiskies; Smirnoff, Cîroc and Ketel One vodkas; Captain Morgan; Baileys; Don Julio; Tanqueray and Guinness.